They don’t go together like Itchy and Scratchy, but here’s hope that the title grabbed your attention. This month, Long Beach has enjoyed two animal-welfare-related events: the Pet Expo and Fix Fest on the 17th at which 168 cats and dogs were spayed or neutered for free and 300 vouchers for the procedures were given out, and Gelson’s monthly adoption event to which Animal Care Services (ACS), Sparky and the Gang, and Long Beach Spay and Neuter brought their beautiful charges for adoption. On Saturday, Friends of Long Beach Animals (FOLBA), the city’s venerable all-volunteer animal-advocacy group, is presenting a third such occasion. FOLBA, whose mission includes humane education and preventing pet overpopulation and unwanted animals through further education as well as spay and neuter, will tie up—so to speak—the month of May with their own happening: the 13th annual WALK for the Animals (see Pet Projects for the activities). FOLBA’s accomplishments include district-approved humane education free to LBUSD schools, the SNIP voucher program that makes it easier for residents served by ACS to fix their pets, and most recently and impressively, the upcoming installation of the FOLBA-funded dual purpose veterinary clinic on ACS grounds. OK, the booze. Panama Joe’s, which has become synonymous in Belmont Shore with happy hour and other spirits-fueled activities, is hosting one of their happy hours Friday, May 30 (that’s today) from 5 to 8:30 PM. Generous and equally spirited (in the heartfelt sense of the word, at the very least) manager Ryan Smith is offering wristbands for sale that entitle the purchaser to a 25 cent drink for every full-price beverage bought; Smith says that all proceeds will go to FOLBA. Volunteers will be on hand to register voters and provide information for the WALK and FOLBA, hopefully without any words slurred. Later in June, PJ’s will also host a dinner for the WALK team that raises the most funds. 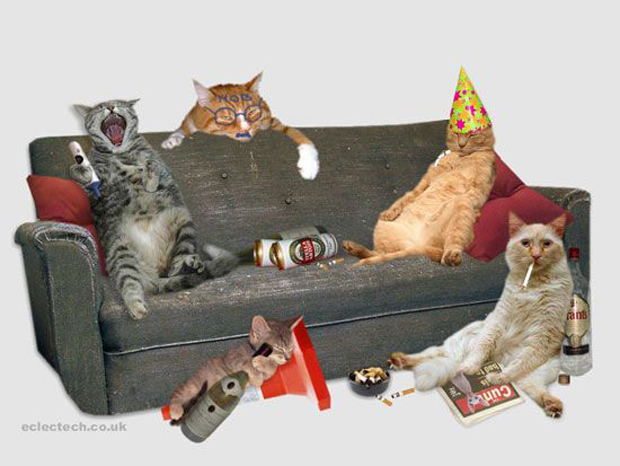 Come down to Panama Joe’s, then, at 5100 E. Second St. and have a nip for the animals. 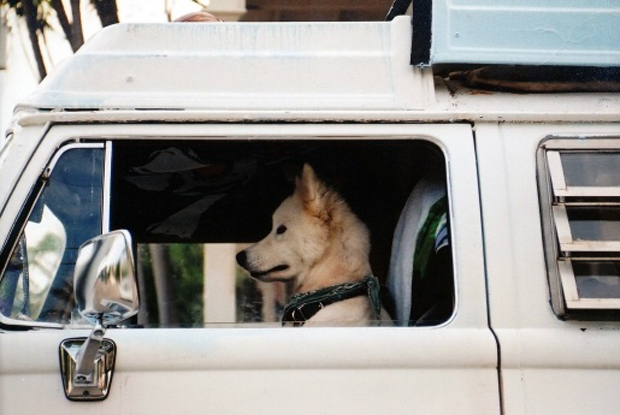 If necessary, have a designated driver waiting. 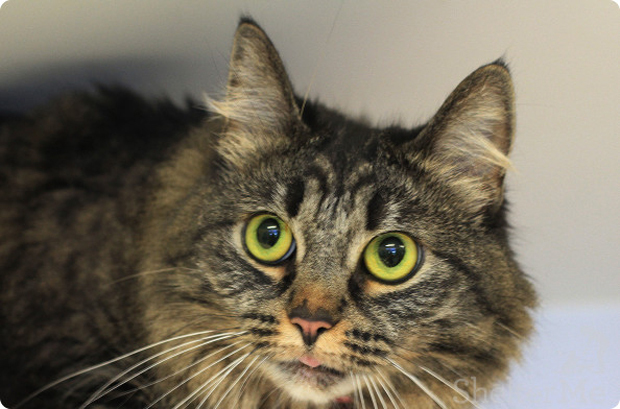 Pantera, age 5, was surrendered by her owners who could no longer keep her. When she arrived at ACS, she had a mouth injury—according to her previous owners, she was run over twice by a car and then disappeared for two weeks. When she came back, she had a hard time eating dry food and her tongue was hanging out. Nonetheless, she wasn’t taken to a vet. ACS took her to a specialist who says Pantera has a normal range of motion for opening the mouth and there are no signs of pain detected, but she now must eat only wet food. If you want a beautiful cat and promise to keep her indoors, come visit Pantera at ACS, 7700 E. Spring St. Ask for ID#A520333. Carry Cary home! 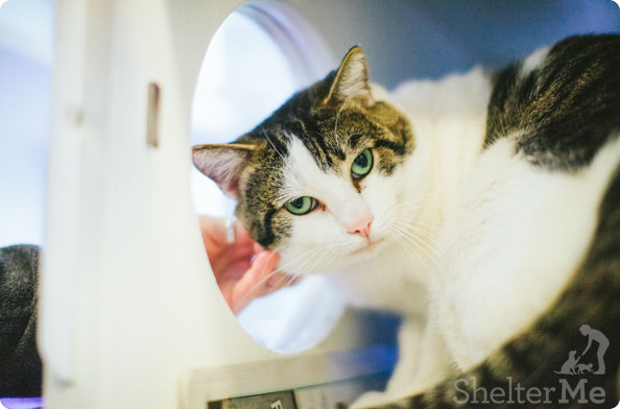 He’s a 5-year-old confident, energetic boy with patches of stripes on his white fur. He has a genetic condition that makes him walk kind of funny, but there’s no pain and certainly no effect on his personality. The shelter staff says that he’s a nice cat. Meet Cary at ACS, and ask for ID#A516921. This little fellow has been vacationing at the home of a kindly family for a couple of weeks, and there’s been no sign of an owner. He’s young, healthy, fluffy, affectionate, playful and would be great company for a cat cuddler if no owner is found. His host says that he’ll walk up to you, plop down on your feet and immediately start purring. 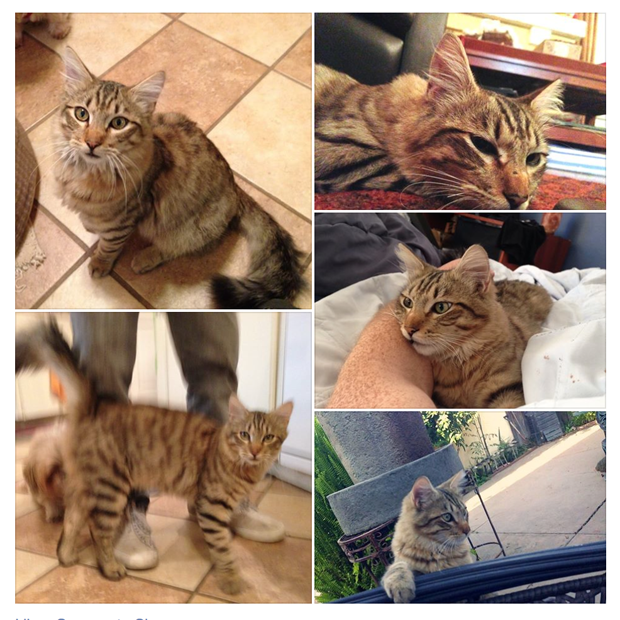 If you know this cat or if you simply want him, click on this link for more photos and info. You don’t want to miss out on a great day in the park for a great cause. Marie Hulett, the host of the Pet Place Radio Show, will be the MC for the event. Joining her will be DogPACT, providing K9 agility and “nose work” demonstrations throughout the day with Tess, a member of the K-9 Bed Bug Detection Team with the uncanny ability to locate bedbugs. (Wonder if they hire out.) There will be pet contests and exhibitions, animal rescue and adoption groups, live entertainmentby the Blue Steel Band, vendors of all kinds, great raffle prizes, food, a kid zone, special guests and much, much more! A bike valet will be available for those who want to ride to the event, which is free and open to the public. Topreregister for the WALK itself, click here.The cost is $30.00 and includes two complimentary Laugh Factory Long Beach passes, great discounts, a WALK T-shirt and more!Registration the day of the event is $35.00. This event raises funds for FOLBA, a nonprofit organization in its 23rd year serving Long Beach and Signal Hill, committed to saving animals’ lives through spay/neuter and education programs and fostering responsible pet ownership, education and humane treatment of all animals.